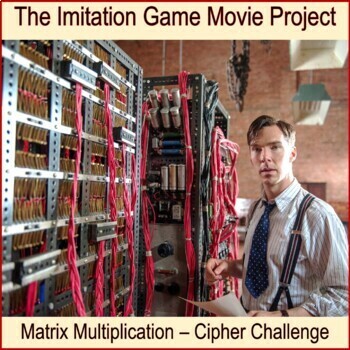 The purpose of this project is to get students excited about mathematics using a compelling historical event and major motion picture: The Imitation Game. This project is best suited for students who are not yet familiar with matrices. The instructions below are intended for use in a regular classroom setting with a mathematics teacher. Included are extension ideas and materials enabling students to complete this unit with greater depth and independence. 1. Watch The Imitation Game movie. 2. 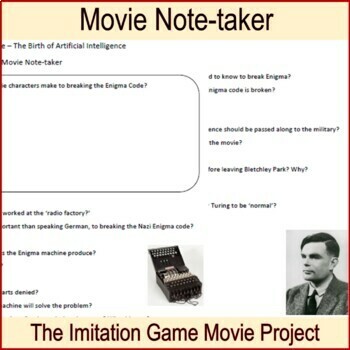 Complete the Movie Note-taker focused on the interwoven relationships of math, problem solving, collaboration, innovation, computer analysis and artificial intelligence. 3. Learn the basic organization of a matrix and how to multiply small matrices. 4. 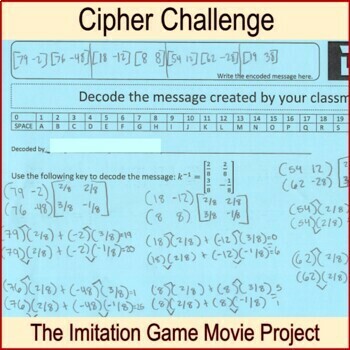 Use matrix multiplication to encode, decode and create ciphers. 5. Advanced students will learn to find the inverse of a matrix using the discriminant. Students are immersed in World War 2 espionage with Alan Turing, Joan Clarke and Hugh Alexander. As the heroes and heroines of the movie race to end the bloodshed in Europe, the insurmountable task of breaking the Enigma code is followed by the even greater moral dilemma of what to do with the information once they have it. This task is appropriate for use with any level of high school students. Students should already know how to multiply with rational numbers. This project, with pre and post assessments, and without the extensions for advanced students, takes six 90-minute blocks to complete. Because of all the integrated parts, it is easy to split into shorter lessons or break it up for use within a full unit on matrices. Within this unit of instruction you will find lesson plans for six 90-minute classes. 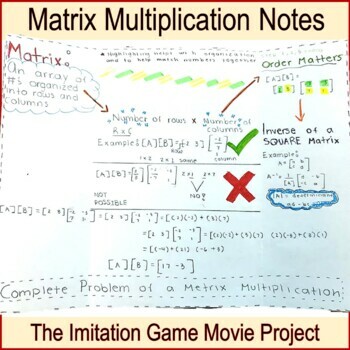 These instructions include a warm-up problem, a recommended portion of the movie to watch, suggested activities with Matrix multiplication and ciphers, and closing discussion questions for each lesson. Materials and instructions are included for those students who may need to complete this project independently. The following downloads are included with this project: Lesson plans for six 90 minute classes, Big Ideas worksheet, Cipher Task Worksheet with answer key, Decode Unique Message Worksheet with sample sheet, Matrix Multiplication Doodle Note-taker with answer key, Encode Unique Message Worksheet with sample sheet, Independent Study Instructions, Matrix Maze Sample, Movie Note-taker with answer key, Independent Project Rubric, Class Project Rubric, Nine Extension Task Ideas, Pre and Post Assessments, Assessment Keys, Matrix Tool Multiple Intelligences Activity, Multiple Intelligences Inventory, and student samples. For more Project Based Learning with Mathematics available at my store: https://www.teacherspayteachers.com/Store/Absolute-Value. This project was created and provided by Absolute Value.